Snorkeling in Key West is an experience that is enriched by the opportunity to see the Great Barracuda (Sphyraena barracuda), colloquially referred to as the Giant Barracuda. If you are looking for the species on a coral reef snorkeling trip, you are in luck, because the species commonly populates the colorful tropical reefs that cover much of Key West’s ocean floor. Other places to find this large predator include swimming through the tangled roots of mangroves, or over sea grasses, hunting prey. The Giant Barracuda is so-named because it is a large fish. A fisherman once reeled in a barracuda that was over 5 feet long and weighed 103 pounds. Typically, though, the fish reaches maturity at 60 to 100 centimeters in length, although there are reports of six foot barracudas seen prowling through the mangroves. The Great Barracuda has shiny silver sides, a white belly, and can have accents that appear to be brown, blue, or green. The fish has a slender, streamlined shape and a round, protruding middle. The fish’s forehead is flat and has a protruding jaw. Although the great barracuda has mouth full of sharp teeth, the fish poses no threat to human beings, except for when divers flash their shiny jewelry around it. Barracudas confuse the shiny jewelry as potential prey, and go on the attack. An experienced dive instructor will tell you to remove all of your jewelry before going on your dive, just to stay safe. 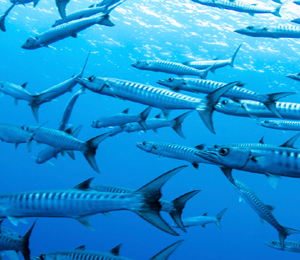 The Barracuda feeds on a wide range of fish species, including: tuna, groupers, anchovies, and herrings. The Great Barracuda is not a good fish for eating. Because of its striking silvery appearance, though, the fish is always a delight to see on a dive. Also, the fish is a popular game fish because it fights hard when you hook into one.